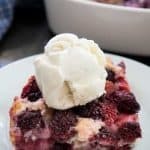 Traditional Blackberry & Strawberry Cobbler - Like Grandma Made! Normally when I make a cobbler I take shortcuts-I’m not going to lie. I’ll use baking mixes and throw some fruit in a dish, pour batter on top and bake. Easy right? 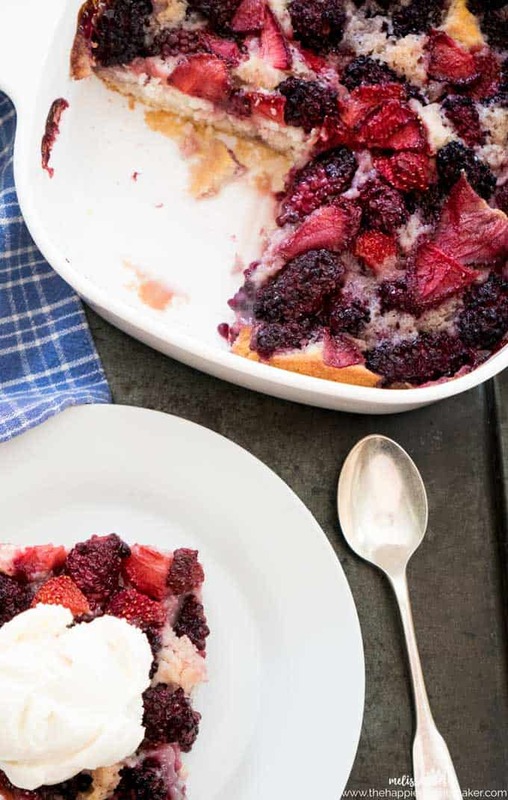 Earlier this week I came across this traditional cobbler recipe online and I was so intrigued by her from scratch, old school approach (especially pouring the batter first then topping with the fruit) that I wanted to experiment with it. I took her recipe (which was lovely by the way!) and tweaked it a little to create this Blackberry & Strawberry Cobbler and I very much doubt that I’ll go back to my old shortcut ways again. 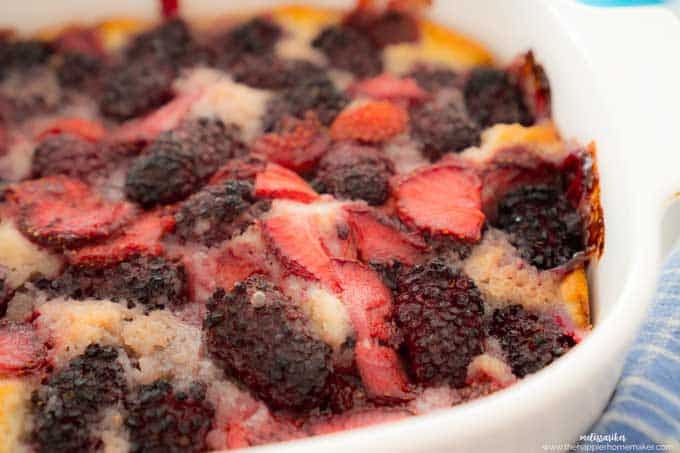 I love the sweet berry combination and the high ratio of berries to batter in this cobbler. The dough bakes up golden with delicious bits of caramelized sugar on top. It’s a winner-especially with a scoop of vanilla ice cream! 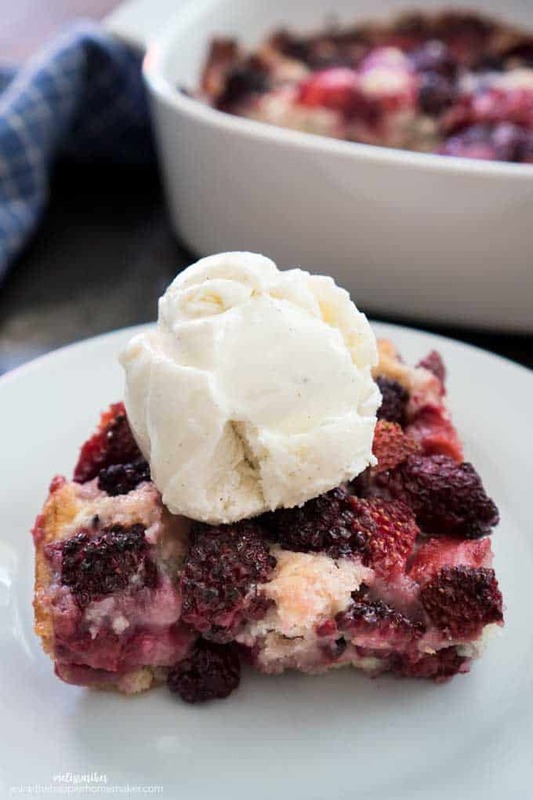 This traditional berry cobbler is very easy to make and tastes delicious-the batter goes in the pan first then the strawberry and blackberry mixture pours over top and bakes up into a sweet, delicate cobbler that is always a hit when entertaining! 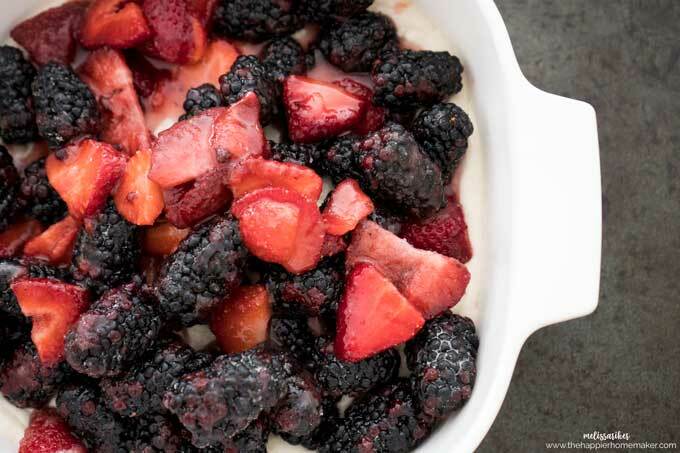 In a medium bowl combine berries with sugar and stir to coat. Allow to sit at least thirty minutes to extract the juices of the fruit. Preheat the oven to 375 degrees. Lightly spray a 8 by 8″ baking dish with nonstick spray. In a bowl combine flour, baking powder, salt milk and butter. Stir by hand until combined. Pour batter in prepared dish. Top with berry mixture being sure to scrape all juices and sugar on the batter as well. Bake for 50 minutes or until golden brown. Allow to cool 30 minutes before serving. Adapted from Charm at Home. What is your favorite “old school” traditional dessert? Let me know in the comments below so I can try it out! I’m making this today for a gathering after church. I’m so excited to try it. Your pictures and recipe look amazing. Thank you for sharing! This was delicious! I used marion berries, similar to blackberries, and mixed them with the strawberries. Great combination! I’ll be making this again! Thanks for the recipe.